Oare is a village and civil parish north of Davington, Faversham in southeast England. It is separated from Faversham by the Oare Creek. To the north of the village are the Oare Marshes, and the Harty Ferry which linked to Harty on the Isle of Sheppey. Kent Wildlife Trust manages a nature reserve that is an important stopping place for migratory birds. According to Edward Hasted, in 1798, it was part of the hundred of Faversham. It was once anciently recorded as 'Ore'. Meaning fenny or marshy place in the Saxon language. The manor of Oare belonged to Odo, Earl of Kent (as the Bishop of Bayeux) and was noted so in the Domesday book. After Odo's trial for fraud. The manor then passed to the Arnulf Kade who gave it to the Knights Hospitallers. During Edward VI's reign, it passed to Lord Clinton (a relative of Edward Clinton, Lord Clinton). Historically, Oare was the southern terminus of the Harty Ferry, which ran across the Swale channel between the then Isle of Harty and the mainland. The village has a church, on the outskirts dedicated to St Peter. The 13th century-built church, is Grade I listed. The village also has two public houses, the Grade II-listed, Shepherd Neame-run Three Mariners Inn and The Castle. Oare Windmill, across the Oare boundary and in Faversham, is believed to date from about 1819. Originally a corn mill, after 1879 it was owned and operated by the Gun Powder Company as part of the Faversham area's explosives industry. During the First World War, the Mill was requisitioned by the government. In 1963, it was converted into a private home. North of the village is the Swale, here is the causeway at the Harty ferry, and over the water to Sheppey. ^ "Civil Parish population 2011". Neighbourhood Statistics. Office for Nationbal Statistics. Retrieved 22 September 2016. ^ a b c d Hasted, Edward (1799). "Parishes". The History and Topographical Survey of the County of Kent. Institute of Historical Research. 6: 381–386. Retrieved 26 February 2014. ^ "Church of St Peter, Oare". www.britishlistedbuildings.co.uk. Retrieved 26 February 2014. ^ "Three Mariners Inn, Oare". www.britishlistedbuildings.co.uk. Retrieved 26 February 2014. 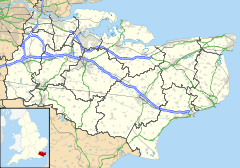 Wikimedia Commons has media related to Oare, Kent. This page was last edited on 30 January 2019, at 01:45 (UTC).